Trump, who unlike other leaders at the summit is not planning to address reporters, did not respond to shouted questions as to whether the UK can trust the US with sensitive material. | Julie Pace also reported to this article. President Donald Trump opened meetings with European Union leaders Thursday against the backdrop of striking anger from Britain over intelligence leaks and a decision by Manchester police to withhold information from the United States about the investigation into this week’s bombing. A British official said Thursday that Manchester police have decided not to share further information on the investigation due to leaks blamed on U.S. officials. The sharp rebuke comes as Trump is in Brussels, a city he once called a hellhole, to address leaders at both the European Union and NATO, a pair of alliances whose necessity he has questioned. Trump appeared to be greeted warmly by European Union leaders, despite his past comments publicly cheering the United Kingdom’s vote to leave the EU last summer and slamming the alliance during his transition as “a vehicle for Germany.” Trump has taken a less combative tone since taking office, praising the alliance as “wonderful” and saying a strong Europe is very important to him and the United States. 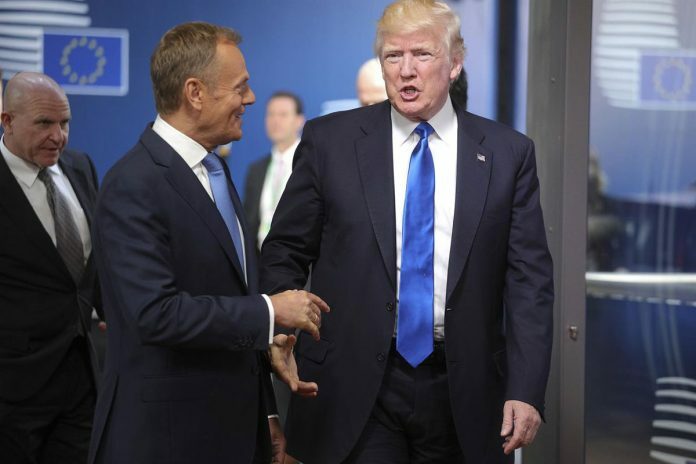 After meeting with Trump on Thursday at the EU, European Council president Donald Tusk said he and the U.S. president agreed on the need to combat terrorism but some differences loomed large. “Some issues remain open, like climate and trade. And I am not 100 percent sure that we can say today — we means Mr. President and myself — that we have a common position, common opinions about Russia,” said Tusk, who said unity needed to be found around values like freedom and human rights and dignity. Trump also had lunch with France’s new president, Emmanuel Macron, who has been critical of the Republican president. As the press watched, the two men exchanged a very firm handshake during their meeting, both men gripping tight, their faces showing the strain. Later in the day, Trump is slated to attend his first meeting of NATO, the decades-long partnership that has become intrinsic to safeguarding the West but has been rattled by the new president’s wavering on honoring its bonds. Trump has mused about pulling out of the pact because he believed other countries were not paying their fair share and he has so far refused to commit to abiding by Article 5, in which member nations vow to come to each other’s defense. But the European capitals that have been shaken by Trump’s doubts may soon find a degree of reassurance. Just like his position on the EU, the president has recently shifted gears, praising NATO’s necessity. Secretary of State Rex Tillerson said Wednesday that “of course” the United States supports Article 5, though Trump still wants other nations to meet their obligation to spend 2 percent of their gross domestic product on defense. “I think you can expect the president to be very tough on them, saying, ‘Look the U.S. is spending 4 percent. We’re doing a lot,'” Tillerson told reporters on Air Force One. He also said he thought it would be “a very important step” for NATO to join the 68-nation international coalition fighting the Islamic State. The move, which is expected during Thursday’s meeting, is symbolically important, especially since the terror group claimed responsibility Tuesday for a deadly explosion at an Ariana Grande concert in Manchester, England. An anti-terror coordinator may also be named. But most changes will be cosmetic, as NATO allies have no intention of going to war against IS. The 28 member nations, plus soon-to-join Montenegro, will renew an old vow to move toward the 2 percent figure for defense by 2024. Only five members currently meet the target: Britain, Estonia, debt-laden Greece, Poland and the United States, which spends more on defense than all the other allies combined. European leaders have been particularly unnerved by Trump’s reticence about NATO due to renewed aggression by Russia, which seized Crimea from the Ukraine in 2014 and, intelligence officials believe, interfered in last year’s American elections. While in Belgium, Trump will unveil a memorial to the terrorist attacks of Sept. 11, 2001, the only time in the alliance’s history that the Article 5 mutual defense pledge has been invoked. He will also speak at NATO’s gleaming new $1.2 billion new headquarters. But while the Europeans greeted Trump warily, tens of thousands gathered in Berlin to hear his predecessor and German Chancellor Angela Merkel discuss democracy and global responsibility at a Protestant conference as the country marks the 500th anniversary of the Reformation. Barack Obama made a case for American involvement internationally, saying “we can’t isolate ourselves, we can’t hide behind a wall” in the hours before Merkel was set to meet Trump in Brussels. Brussels is the fourth stop on Trump’s nine-day international trip, the first such trip of his presidency. Protests were slated to take place outside the heavily guarded security perimeter near the city’s airport and downtown. Trump is slated to leave Brussels late Thursday for the final piece of his trip, a two-day stay in Sicily for G-7 meetings.